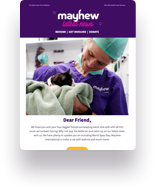 Mayhew will once again be attending Ealing Animal Charities Fair. Celebrating its 41st year, the event represents a variety of local, national and international animal welfare causes. This is a fantastic opportunity to learn more about animal welfare whilst picking up some treats for you and your four legged friends. Vegetarian and vegan refreshments are available throughout the day and entrance is free! Make sure you visit our stall and see what goodies we have in store for you. You can find out more details about the event here.